Now, we’re in the 21st century. Behold the power of digital publishing. Gotta love it. 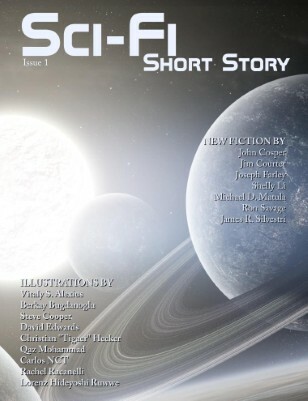 I haven’t yet picked up a copy of “Sci-Fi Short Story Magazine,” but I will say that the cover art rocks. And the title, well, the title pretty much says it all. Contributors include Elizabeth Barrette, John Cosper, Jim Courter, Ron Savage, James R. Silvestri, Shelly Li, Michael D. Matula and Joseph Farley. If you’ve read this magazine (or appeared in it), let me know. I want to hear about it! It’s always a pleasure to feature a Colorado science fiction author, and Laura E. Reeve is no exception. Fans of David Weber or Jack Campbell will enjoy her military science fiction series about flawed but likable pilot Major Ariane Kedros. Her latest book, Pathfinder, just came out this summer and is in stores now. 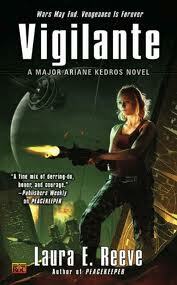 Sci Fi Bookshelf: For those who haven’t picked up a Major Ariane Kedros novel yet, how would you describe the series? Laura E. Reeve: Military-flavored SF Adventure. The heroine, Reserve Major Ariane Kedros, had her identity erased by the government for her own protection, due to her missions during the war. She now has a civilian job as pilot and explorer, but still undertakes Intelligence assignments–always dangerous, because not everyone supports the “new peace.” She also has to deal with wartime guilt and sometimes, against her own inclinations, she has to help old enemies. SFB: What authors are your biggest influences? LER: C.J. Cherryh fascinates me with her ability to spin alien mindsets and complex politics. Perhaps she even affected me subliminally; I only recently realized I used the same main character name she used in her Cyteen books, which I’d read years ago. Other SF/F writers I like who might have influenced my writing are Dan Simmons (irresistible subplots and character agendas), David Brin (dolphin space explorers–genius! ), Vernor Vinge (suspenseful plots), Joan D. Vinge (riveting character conflict), and Marian Zimmer Bradley (because, in the end, it’s about characters and story). At the least, I hope some of these authors’ skills have rubbed off on me. SFB: What’s your favorite part about the writing process? LER: I love editing most, by far, because the blank page is still intimidating to me. I also have the problem that I have to write sequentially, to know what each character has been through up to that point–which makes my first drafts pretty painful. However, once I have something to work with, I’m in heaven. I can add scenes, tighten connections between plot/subplot points, enhance characters, and “mine” for more conflict. SFB: What are you working on next? 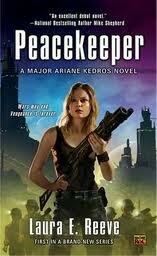 Any more Major Ariane Kedros novels coming up? SFB: Do you have any advice for new writers today? LER: Persevere, but remain flexible. Most writers understand perseverance; finish your work and keep pitching it, right? Agreed. But understand the market and keep moving beyond the one beautiful manuscript you’re trying to sell. I’m not advocating “following the market” or warping a story into something it isn’t. But the ideal flexible writer has several finished manuscripts under his or her belt, and knows what to pitch to whom. An ideal flexible writer also begins working on a different manuscript as soon as the current one is in shape to be submitted. Note that I said an IDEAL flexible writer, and I’ve got the cautionary tale: In late 2004, my agent said perhaps this wasn’t the “right time” for my traditional fantasy, and it might not be the “first manuscript” I sold. What tactful wording she used! Did I have anything else? Unfortunately, I’d just spent a year writing a sequel to that manuscript, which was NOT the best use of my time. I made sure to finish the draft I was working on, archived all the information about the world, and put my traditional fantasies on the shelf. I then switched gears, and dug up the beginning chapters of a novel that would eventually become Peacekeeper, my first sale. Now, I’m going back to that first traditional fantasy, editing it, and sending it in. Then I’ll be moving on to a steampunk fantasy that’s been growing in the back of my mind. I’m trying to be more flexible. SFB: We’ll keep our eyes open for future books. Laura, thank you so much for your time! LER: Thank you very much. Believe me, this has absolutely everything to do with science fiction, bestselling authors and the Nebula Awards, since all of these things undoubtedly have one thing that links them: pizza. Come on, you can’t tell me you’ve never eaten a pizza while watching Star Trek or between events at your last convention. Right? And I guarantee you that Connie Willis, Joe Haldeman, Orson Scott Card or SOMEBODY with a Nebula on their mantelpiece has eaten pizza, possibly within the last week. And what about Pizza the Hutt? I rest my case. 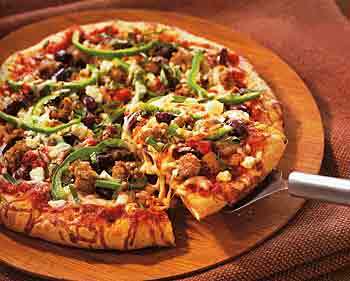 Science fiction is inextricably linked to pizza. Free science fiction novel winner! Congratulations to Charity Bradford, winner of the first-ever SciFiBookshelf.com contest! Charity, email your mailing address to me at LaurenceMacNaughton(at)yahoo(dot)com, and I’ll pop that book in the mail to you. Science fiction novel giveaway this Friday! I’m thrilled to announce the very first SciFiBookshelf free book giveaway! I’ve been working hard to fit it in with all of the award-winning author interviews, science fiction news and fun stuff you can use. But the time has finally come for our first contest. No sweat, though. Trust me, it’s an easy one. All you have to do is leave a comment for a chance to win! And what book will I give away? I’ll give you a hint: it’s from a bestselling author I’ve interviewed right here on SciFiBookshelf. I’d love to spill the details now, but patience — gotta wait until Friday!